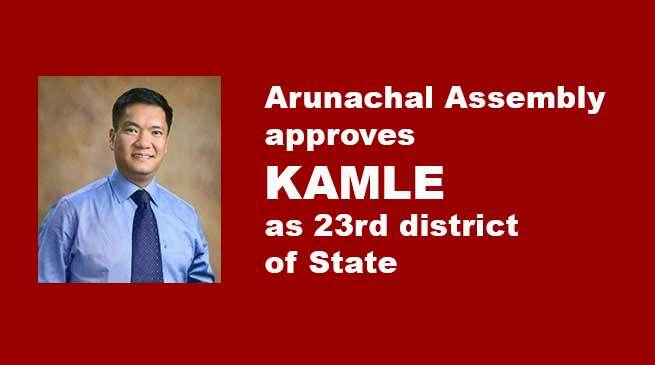 Kamle become the 23rd district of Arunachal Pradesh which is approved by voice vote in the house. under the Arunachal Pradesh (Re-organisation of districts) (Amendment) Bill,2017. Tamar Murtem while participating the bill said that 25th Raga assembly located between lower and Upper Subansiri is one of the most backward area with a population of more than 22 thousand inhabitant by tribal 40 % in LS while 60 in LS, 6 circle including Raga, Dolungmukh & Kumpurijio in Lower Subansiri while 3 are in US. All election matter are controlled by DEO Daporijo, there are 7 ZPM 4 from Lower Subansiri and 3 from Upper Subansiri. Lack of connectivity area of two district have forced serious challenges by the distract administration by two district administration in matter to health care and other issue. All the area are not properly connected and there are connectivity problem since last 7 decade. Curving of Kamle district would bring an end to all syndrome. The people of Raga have donated land at Yaga measuring 8500 sqmts and 486 acres for district HQ. Marko Tado said it was not demand of people of Raga area only but of Nyishi Elite society and people of Nyishi community. Nabam Tuki (Sagalee) supporting the bill said that the administration will be delivered at the door step. Congratulating the council of Minister led by CM Pema Khandu for approving in the cabinet. Recalling the demand previously and requested the both deputy commissioner to forward detail of proposal, Kra Daadi, Namsai and lower Siang, there were few problem with HQ only. He requested to provide sufficient required fund for functioning of the district. Nacho MLA Tanga Byaling appeal for creation of post accordingly for the district. Borduria-Bogapani MLA Wanglin Lowangdong while congratulating the people of Kamle district said development cannot be an excuse of demanding for district and said that ‘Rome was not built in a day’ . who know there may be 60 district in future and urge upon not to create district on the basis of opportunity and time will come all major and minor tribes will demanding of district and urge upon to create a criteria and system for creating of any district in future. Roing MLA while participating the Bill said I am not supporting the bill rather congratulating the people of the newly created district Kamel. He said if at all Kamle having a population of 22,000 rather there are population of more than that and is capable to become a district. He observed that development should also reached to the district and there should be a holistic approach and it should be looked through different parameter. among other suggested view and apprehension of creation of new district adn demanding development as well congratulation to the people of newly districted Kamle district. CM and Incgarge of Minister DA Pema Khandu while replying on the Bill said that it was a longfelt demand of the people of the area and since NEFA. During UT there was five only and till date including capital we have 22 district. We doe not creat district basing on community but keeping aim and objective. Side by side the development of the new district will get momentum. Apart from infrastructure there shall be requirement of 22 crore. Four district were created during 2013 and requirement of infrastructure and post are still there and not being fulfilled. The 1983 district creating policy need to be revisited and will bring to the house for approval after discussion. There are many demand of such new district. Congratulating the people of the newly district Kamle appeal the members to support the bill while moved which was passed by voice vote and clapping from the members of the house.